It’s a magical combination — the sweetness of giant medjool dates and the silky bitterness of dark chocolate. Bisou Dates & Chocolates is the brainchild of Paul Merritt and Maha Surani, who began brainstorming chocolate-y date ideas one morning over breakfast while enjoying coffee and a few dates. They started experimenting with flavour combinations and recipes last fall, ramping things up over the past couple of months with an e-retail site through Shopify and a successful turn at Dessertfest at Lansdowne Park in June. City Bites caught up with the dessert duo to learn more about how Bisou Dates & Chocolates was born — and their future plans. Are you partners in business and life? Maha: We like to say that magical things happen when you bring together a Middle Eastern girl and a Cape Breton boy! We have been together for two years. Paul: As for work, I left the military a couple of years ago, so starting Bisou Dates & Chocolates is part of my transition. Maha: I still work full-time with Colleges and Institutes Canada on a program that educates immigrants before they come to Canada. How did this sweet idea come to pass? Maha: One day over breakfast we were in a creative mood and started brainstorming new ways to enjoy dates. 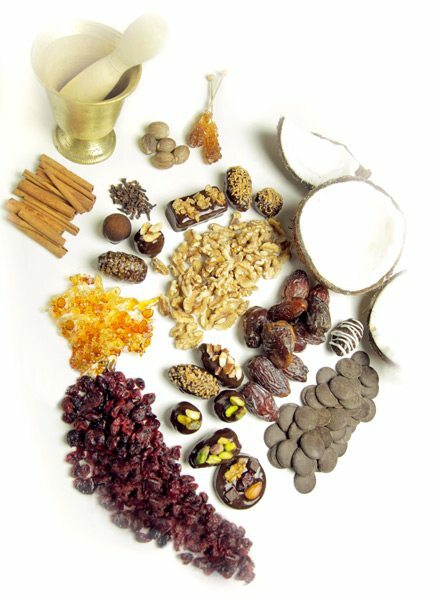 We know dates go with walnuts and almonds, which are both popular combinations in the Middle East, but what about different flavour combinations? What about dates and marzipan? What about dates and tahini? We saw the possibilities for a new business. Do people eat chocolate covered dates in the Middle East? Paul: That is our Canadian addition! We began by enrobing dates in dark chocolate — we figured if that worked, we could then figure out what we might put inside them. The “inside” flavour combinations evolved naturally from there. How long were you experimenting with flavours and ingredients before you launched? Paul: We started experimenting in the fall and incorporated in January. I focus on the chocolate and Maha is the expert on the fillings. Maha: The Citrus Sunset [a chocolate-covered date filled with candied orange] and the Seabreeze [a chocolate-covered date filled with roasted almonds and drizzled with sea salt and caramel] are the two most popular. Was it a big leap to launch a food business? Maha: Not really. Paul has always wanted to start a business, and I actually owned my own herbal tea business years 20 years ago in Virginia. I have a very entrepreneurial spirit, so I’ve been thinking for years about launching another food business. How did you learn to work with chocolate? I hear it’s tricky. Paul: We didn’t know anything about chocolate when we started, so we took a course at Algonquin College, which was amazing. What type of dates do you use? Maha: We researched a lot of dates and settled on the medjool date, which is known as the ‘king of dates.’ It’s the sweetest, most luscious, most caramel-y textured date. The ones we work with are grown in California. 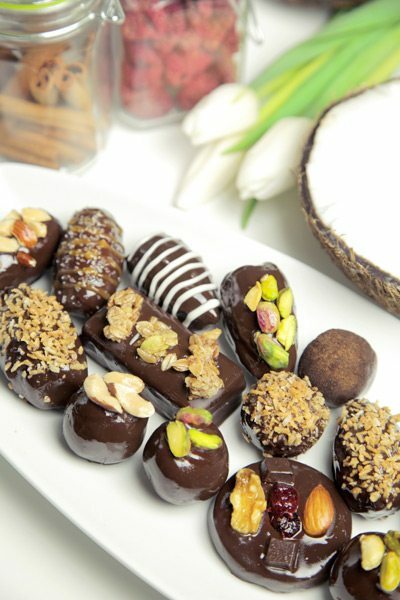 Along with the chocolate-covered dates with fillings, you also make truffles and bars. Tell me about those. Paul: The truffles are delicious — and all-natural. 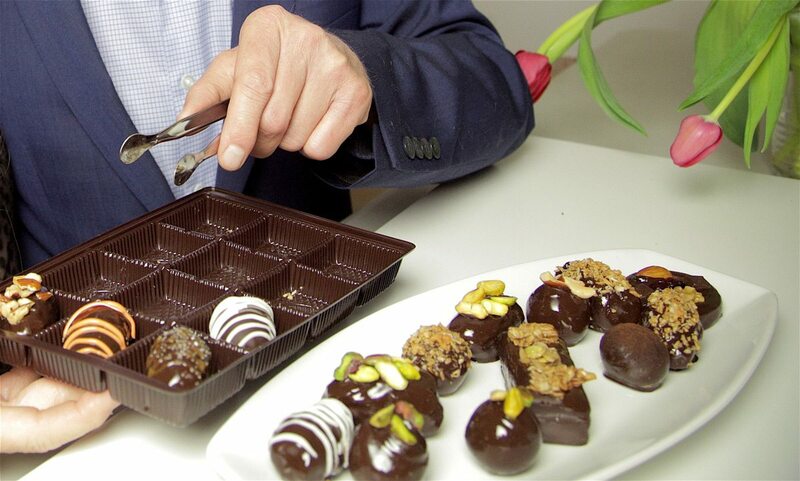 The centres for most of our truffles have just three ingredients — dates, cocoa, and walnuts. You puree the ingredients, then enrobe them in chocolate and roll them in coconut or cinnamon or pistachio, depending on the truffle. There are no additives. And the granola bars? Are these your take on energy bars? Paul: We were surprised that the bars are really popular with runners. They like it because the sugar is all-natural so they don’t experience that crash that you get from other products. Runners like that they’re nutritious, as well. Maha: We make two bars, one of which isn’t on the website yet. The newest bar is called the Three-Minute Mile — the idea is that you eat this bar and it gives you the energy boost to run your best. We make all our own granola. In the Three-Minute Mile, there’s a date blend sandwiched between two granola bars and dipped in the dark chocolate. It’s not the most attractive of our products, but it tastes amazing. Do you have any other products in the works? Maha: We make a number of products that aren’t on the site, but they’re more for special events. One example is a date cake that is really, really delicious. It has a cream cheese frosting and is drizzled with a date and tahini syrup. I hear your first big event was Dessertfest this past June at Lansdowne Park? Maha: We consider that our first big test. It was so reaffirming! Kids were coming up and eating our chocolate-covered dates, which was a surprise. We thought the dates would be more popular with an adult market, but everyone loved them. Paul: We’re hoping to be at either the Lansdowne Farmers’ Market or the Carp Farmers’ Market in the fall. We’re just connecting with those markets now. We’re also connecting with embassies because, especially for the Middle-Eastern embassies, they’d make such a great fit.